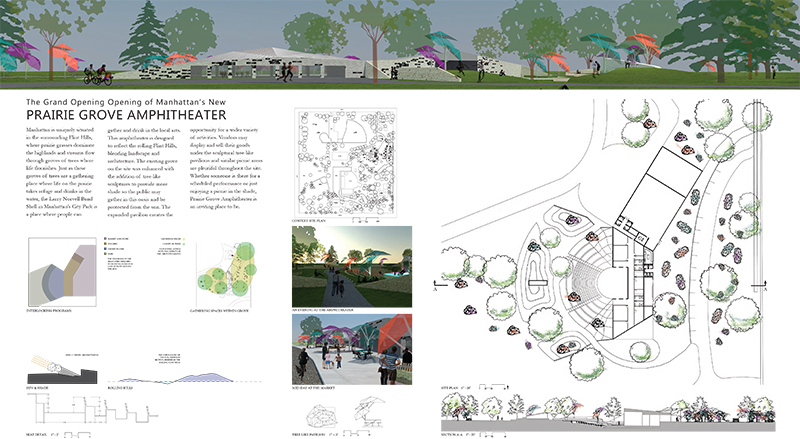 The College of Architecture, Planning and Design at Kansas State University (APDesign) challenged 12 teams each comprised of three students selected from the four disciplines of APDesign (architecture, interior architecture & product design, landscape architecture, regional & community planning) to a public space/amenity competition for the design of a new outdoor performance venue in the Manhattan City Park. 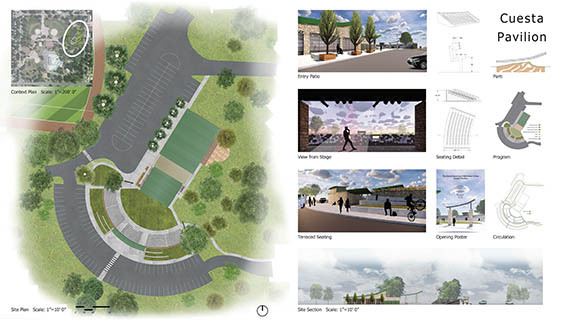 The competition, including scholarship awards, was sponsored by a local philanthropist with the intent of raising interest in building an improved public resource for the greater Manhattan Community. 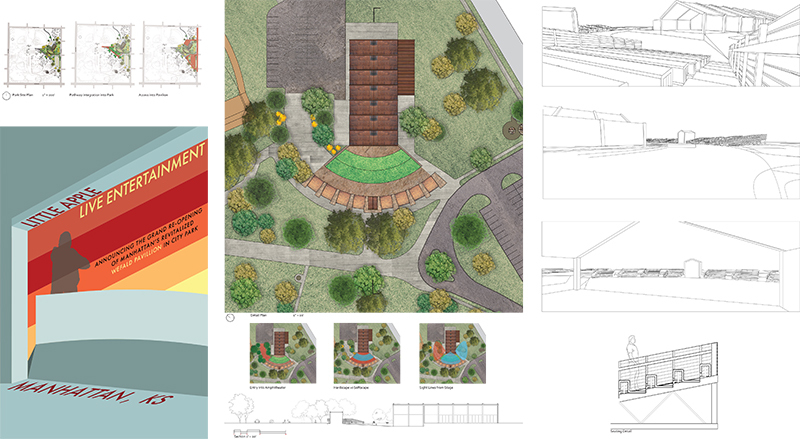 Maggie Schulte, 5th year, Interior Architecture & Product Design, St. Louis, MO; Kathryn Zieno, 5th year, Architecture, Bellevue, NE. 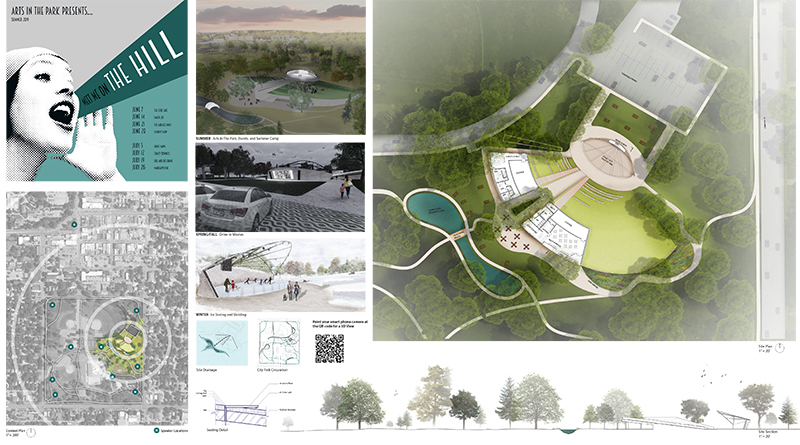 Second place awards went to team AGE Design Group for their project titled “Cuesta”. 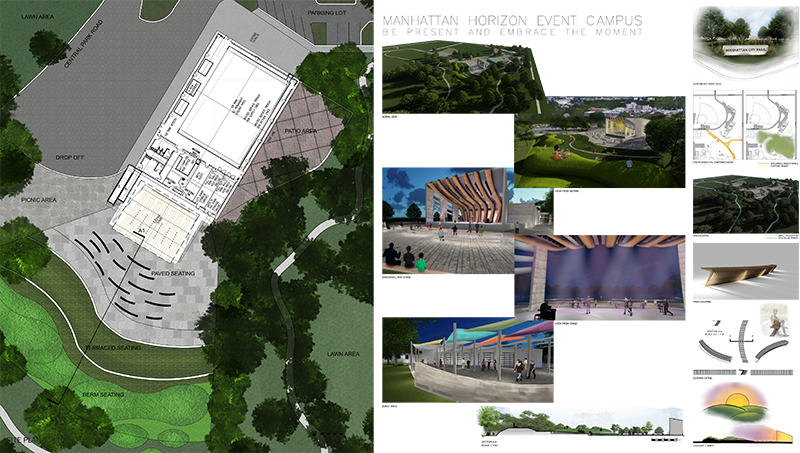 Team members include: Grant Pasowicz, 3rd year, Landscape Architecture, Overland Park, KS; Emile Batrouny, 3rd year, Interior Architecture & Product Design, Overland Park, KS; Avery Don, 3rd year, Architecture, Overland Park, KS. The second place award was for $3,900 in scholarships. Third place awards went to team ASK for their project titled “Landwave”. 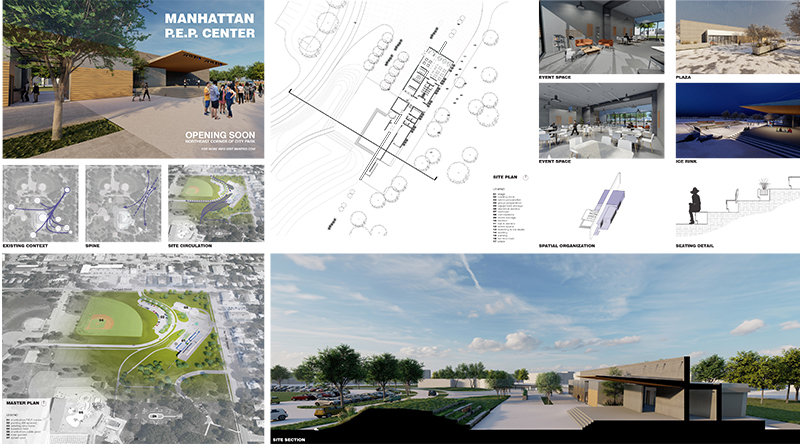 Team members include: August Titus, 3rd year, Landscape Architecture, Montezuma, KS; Solomon Renfro, 4th year, Interior Architecture & Product Design, Manhattan, KS; Kazem Namazi, Post-Bac , Architecture, Iran. Students will split the third place scholarship award of $2,900. 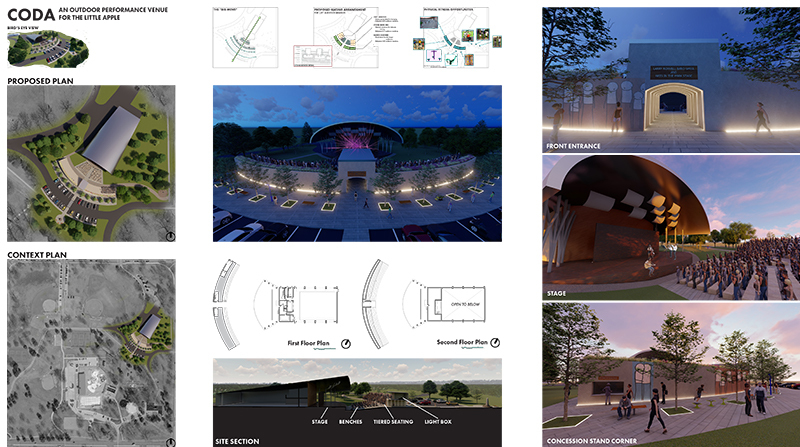 Two honorable mentions were awarded to team Parti_Time with their entry “The Hill”; members included Makenzie Yeager, 4th year, Landscape Architecture, Baldwin, MO; Alison Trent, 5th year, Interior Architecture & Product Design, Kansas City, MO; Tara Bray, 5th year, Architecture, Kirkwood, MO. 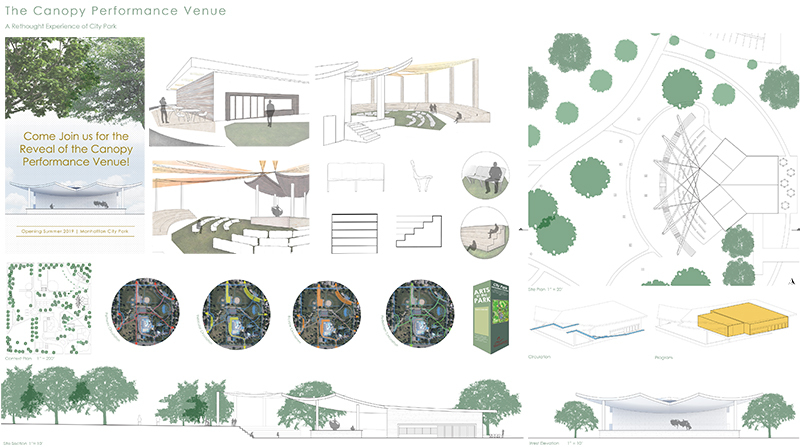 The second honorable mention was awarded to team Olmstead’s Army for their project “Natures Theater”. 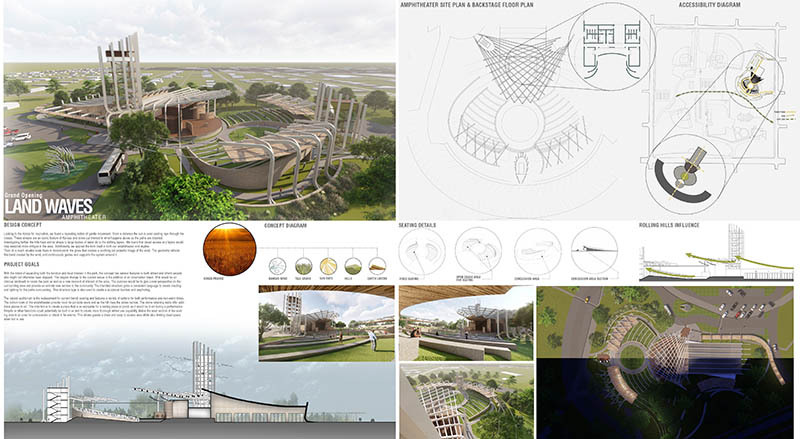 The team included Priyasha Shrestha, Post-Bac, Landscape Architecture, Sindhuli, Nepal; Morgan Nicole Nunay, Post-Bac, Regional & Community Planning, Alexandria, KY; and Gaurav Neupane, Post-Bac, Architecture, Itahari, Nepal. Jurors for the event included: Tracy Anderson, AIA; Anderson Knight Architects; Mike Dodson; Mayor, City of Manhattan Kansas; Ron Fehr; City Manager, City of Manhattan Kansas; Karen Hibbard, Director; Manhattan Convention and Visitors Bureau; Phil Howe; Founder, Kansas State Bank; Jenny and Kevin Murdock: Music at the Murdocks.